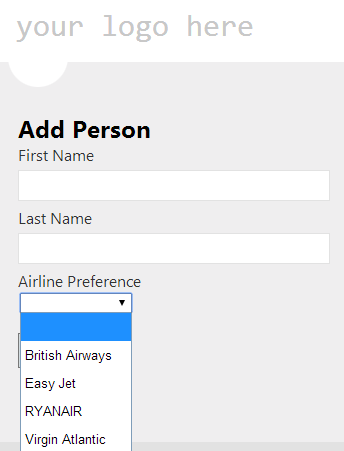 Dropdown list with MVC5.1 – now out of the box! Last year I made this post showing a clean way to render a dropdown list in MVC. Recently MS released MVC5.1 (prerelase) and excitingly it now has Enum support. Jon Galloway has written an excellent post outlining this change. The .Net team have added a new HTMLHelper extension called EnumDropDownListFor that will render an Enum as a dropdown box (or radio button list). How does this compare to the long winded solution I outlined last year, I hear no one asking? with our view rendering our model with one line. 5.1 is still prerelease and at the time of writing @Html.EditorForModel will not render an Enum dropdown list. It currently needs a push in the form of an Enum template (as described in Jon’s blog) to know how to display an Enum. With my lean hat on, for the purpose of this blog the following will suffice. Now go the Add Person page and voila, a DropDownList is present. A common situation you can find in MVC, is to have an Enum in your model and want that rendered as a dropdown list in the browser. If you are lucky enough to be using MVC5.1 (or higher), I’d recommend you look at this post that shows how to do this using the new Enum Support that’s part of MVC5.1. If not, then read on. There are a number of ways of solving this, Currently on StackoverFlow there are 20 answers to this question, but none of them consider what I consider the more elegant solution of using templating. For anyone not familiar with templating, I’d recommend reading Brad Wilson’s excellent blog on it. The following post is how I like to do it, using Asp.Net MVC with C# and the Razor view engine. This post explains one way of achieving this. We need to provide a template for MVC to handle Enums in order for it to render them as a dropdown list. 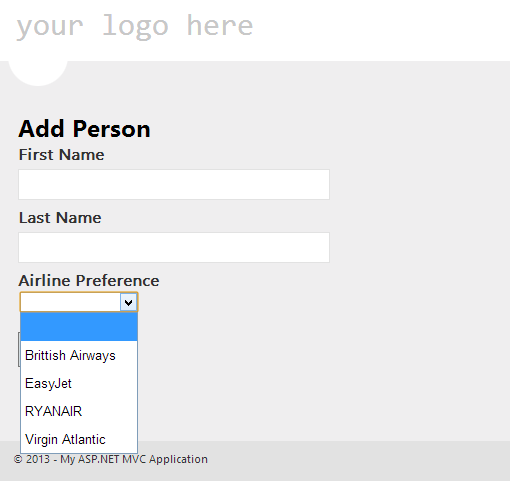 We could provide a template whose name matches our Enum (AirlinePreference) and in that view render our dropdown. 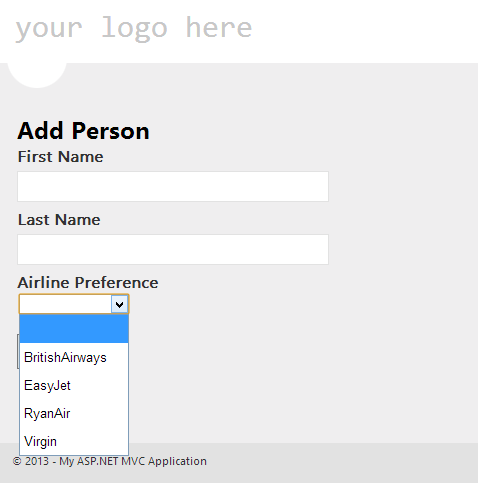 We could also supply a UIHint attribute on our model property, to help MVC find our template. I prefer to alter the string template, to look for a property type of Enum and render all Enums in my models by the same piece of code without having to be explicit about it with each Enum in each model. This helps have a consistent way of rendering an Enum the same way on all pages with the least amount of code. The first line gets the type of our property, taking care to cater for a value that may be null. The second line will render a EnumDropDownListFor for an Enum or a TextBoxFor for a (non) Enum, e.g. a string. First couple of lines determine the enum type (taking care of the null case too). Then we get an array of Enum values and cast it into a enumerable collection of objects. From here we can easily convert that to an enumerable collection of SelectListItems with a linq query. Once we have the collection of SelectListItems, it’s passed into the DropDownListFor helper to render it as a select list for the client. Much improved, but not very user friendly to see BrittishAirways, displayed with no space in between. We could add a Description Attribute or a Display Attribute to the enum values and update the linq query to display that instead of enumValue.ToString(). However, I’m going to go with a convention over code style approach and use a resx file to store the value of what we want to render to the screen. Also, as we are using a resx file to store the value that get’s displayed to the user we can easily make this support more than one language. The final thing to do is update the EnumDropDownFor extension to use these resource values, instead of the enum value. We’ve added the static method GetResourceValueForEnumValue, which simply creates a key, based on our convention of [Enum Name]_[Enum Value] and then uses the ResourceManager to lookup the corresponding value from the Enums resource. 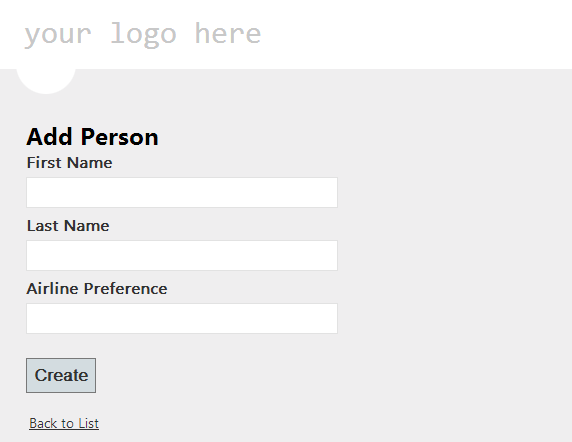 Finally, earlier I mentioned that I was using @Html.EditorForModel to create the form in the view. You could also call @Html.EditorFor(x => x.AirlinePreference) if you need to have more control over where to place the dropdown on your form. You can also explicitly call the EnumDropDownListFor of course. Last year I wrote a post, Catch All WCF Errors, showing how you can implement IErrorHandler to log and process all errors in a WCF service. This post is how to achieve this in a Asp.Net MVC web site. If you are using MVC3 or greater, your default project is already setup to use the HandleErrorAttribute. What does the HandleError filter do? It only handles http errors, of 500. This interface exposes just one method, OnException, which is called when ever an unhandled exception is thrown. All exception filters implement this filter, including the HandleErrorAttribute. By applying the HandleErrorAttribute filter at a global level, all errors will be handled by it. So, in order to extend our application to also log errors, you could either create a class that inherits from the HandleErrorAttribute and override its OnException method to also perform logging, or you could create another filter that implements IExceptionFilter and register it globally. I prefer the latter option, as I think its implementation is cleaner. The ExceptionLoggingFilter above, uses log4Net as its logger and very simply will log all exceptions that occur in a MVC web application. As you can see we are now adding our ExceptionLoggingFilter to the GlobalFilters collection and passing an instance of the log4Net logger into the RegisterGlobalFilters method. All this wiring up can of course be done neater by using an IoC container of your choice. Yup, they won’t get logged using the above code, as IExceptionFilter is only concerned with errors in the application. In order to log a 404 error you either need to do something ugly, such as write some code in the Application_Error or use a third party tool like Elmah. This is a good, solid solution for a lot of people who just want something that works without having to understand what an IExceptionFilter is. ELMAH (Error Logging Modules and Handlers) is an application-wide error logging facility that is completely pluggable. It can be dynamically added to a running ASP.NET web application, or even all ASP.NET web applications on a machine, without any need for re-compilation or re-deployment. Logging of nearly all unhandled exceptions. A web page to remotely view the entire log of recoded exceptions. A web page to remotely view the full details of any one logged exception, including colored stack traces. In many cases, you can review the original yellow screen of death that ASP.NET generated for a given exception, even with customErrorsmode turned off. An e-mail notification of each error at the time it occurs. An RSS feed of the last 15 errors from the log. This post was about showing you how to have complete control over logging in your MVC web application by implementing IExceptionFilter.